Where to Hide the Bits ? 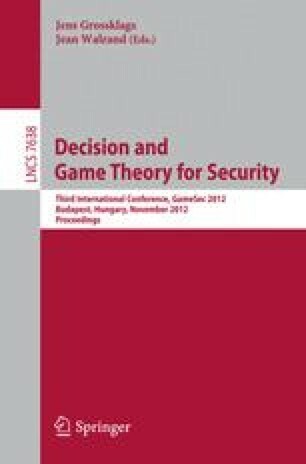 We present a stochastic two-player zero-sum game between defender and attacker related to the security of practical steganography. The defender wants to hide a message in a cover object drawn by nature. The attacker wants to distinguish plain covers from those with a hidden message. We study the case of n-bit covers, independently but not identically distributed to allow for variation in the predictability between parts of the cover. The defender knows the predictability exactly and chooses k embedding positions. The attacker may obtain side information to predict one chosen position of the cover and compare it to the observed object to make a decision. We present a unique mixed strategy Nash equilibrium for this game. It turns out that the attacker’s strategy is independent of the number of hidden bits k.